Saturday, a leisurely start. Chris Re, Martha and Emma C went along the Glen to walk up Mullach Clach a Bhlair. The river crossings were quite exciting, with socks-off, jumping, full-on wading and Martha-flinging techniques all put to good use. The summit was so wet it had a moat, and the crew returned via a high level route, to avoid most of the earlier obstacles. They did see a caper though! 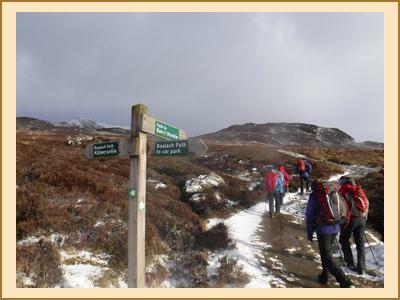 Chris Ro, Emma Y, Gillian, Claire H, Pauline, Tim, Alan and Anne headed through the woods, saw a different caper, wandered up the hill through endless bog, finding snow just below the summit of Sgor Gaoith. 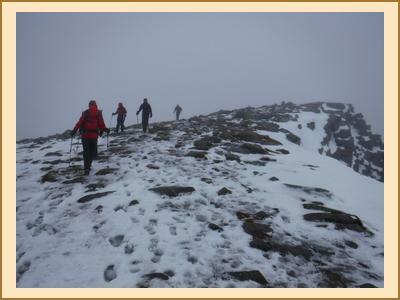 The summit itself had a bit of ice, but not much for an over-1000m Cairngorm mountain in late Jan! We tracked cross-country back to the path and for welcome showers. Meanwhile Fiona and Mike went to the Argyll Stone and Sgor Gaoith, returning via most direct route. T'other Clare was solo on Ben a Chlachair. No. First of all, she found an injured jackdaw on the road. Left it in the car whilst she was on the hill. Brought it back for safekeeping in a box. Fed it posh dog food which went down well. Named Caesar as a reward for surviving the night. At the time of writing he is still alive and well, enjoying luxury life in a cage in Newcastle. With a full house at Lagganlia, Kenny stayed at the water sports centre and joined us in the evenings. He was up Croidh-La in Glen Tromie on Saturday. Sunday: many chose to return straight home to domestic chores, Aussie Open tennis etc. The remainers went up Ben Vrackie which was incredibly windy but there were some fab ice formations on the lochan!